October 31 marked the last day of the Haro Strait voluntary vessel slowdown and the Strait of Juan de Fuca lateral displacement trial for 2018. Overall results of both initiatives will be available in spring 2019. For up-to-date information, please subscribe to the ECHO program newsletter. The remaining 74 southern resident killer whales are listed as endangered under both the Species at Risk Act in Canada and the Endangered Species Act in the U.S. Both countries’ governments have highlighted the need to develop and implement measures to reduce underwater noise generated by vessels which research indicates can interfere with whales’ ability to hunt, navigate and communicate with each other. In 2017, the voluntary vessel slowdown trial in Haro Strait demonstrated that reducing vessel speeds is an effective way of reducing the underwater noise generated at the vessel source, as well as reducing total underwater noise in nearby habitats which may in turn benefit the behaviour and feeding success of the southern resident killer whale. The Minister of Fisheries, Oceans, and the Canadian Coast Guard and the Minister of Environment and Climate Change Canada, as the Minister responsible for Parks Canada Agency, recently formed the opinion that the SRKW is facing imminent threats to its survival and recovery. With this in mind, a refined approach was proposed for voluntary vessel slowdown action in Haro Strait in 2018 which utilized different vessel speeds and a dynamic slowdown start and end date in an effort to both maximize vessel participation and benefit to the whales. Transiting Haro Strait (see figure of slowdown and transition areas below) at these reduced speeds could add between 9 and 15 minutes to the total transit time, depending on the vessel type. Between July 1 and October 31, 2018, the shipping industry participated in a voluntary vessel slowdown in Haro Strait. The slowdown began once the southern resident killer whales were confirmed as present within Haro Strait by hydrophone data and trusted observers. The slowdown ended October 31, 2018 and was communicated to mariners through a Notice to Shipping and via the Pacific Pilotage Authority, BC Coast Pilots, shipping associations and agents, and on this webpage and the ECHO newsletter. With varied vessel speeds and reduced anticipated delay times, we encouraged all vessels to participate where possible. Participation rates by sector was reported on regularly throughout the slowdown in the ECHO newsletter. 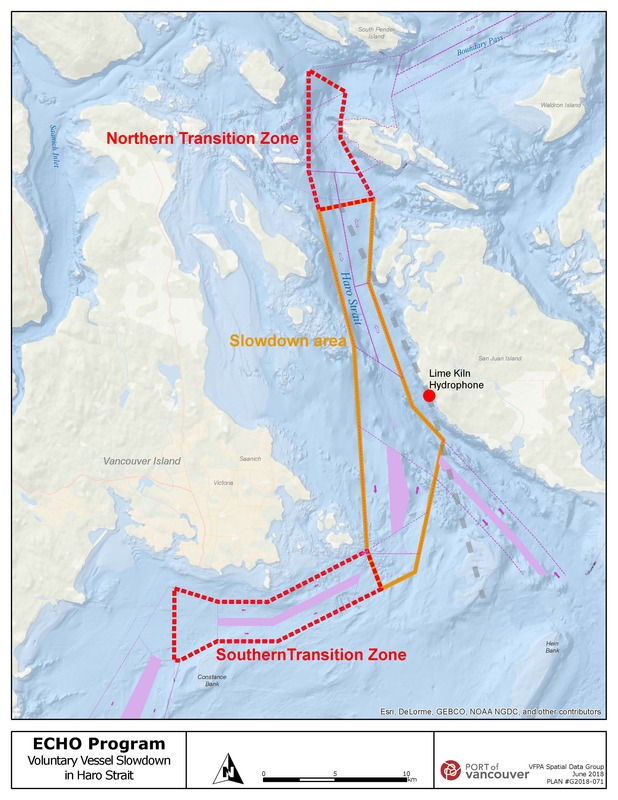 The slowdown area in Haro Strait between Discovery Island and Henry Island was unchanged from 2017. Vessels were encouraged to use the transition zones to slow down to the appropriate speed prior to entering the trial boundary. The trial distance is 16.6nm inbound, 14.9nm outbound. Download the map here. Similar to 2017, the ECHO Program monitored underwater noise levels before, during and after the trial using the hydrophone located at Lime Kiln. Southern resident killer whale presence was monitored and recorded by hydrophone and human observers. Vessel participation rates was reported by the Pacific Pilotage Authority and was also monitored by AIS data. Following the end of the slowdown on October 31, 2018, an analysis will be conducted by the ECHO Program to evaluate the effectiveness of the initiative. For more information on the slowdown please contact the ECHO Program team at [email protected] or Vancouver Fraser Port Authority Operations Center which is available 24/7 at 604.665.9086. Visit the ECHO program website for more information. COSCO Shipping Line Canada Inc.
NYK Line (North America) Inc. Ocean Network Express (Canada) Inc. The Enhancing Cetacean Habitat and Observation (ECHO) Program and Transport Canada supported by U.S. Coast Guard, Fisheries and Oceans Canada (DFO), Canadian and U.S. marine transportation industry, Aboriginal individuals and environmental and conservation groups, undertook a voluntary trial in 2018 to study how laterally displacing vessels away from known southern resident killer whale (SRKW) feeding areas would affect the underwater noise levels in those areas. DFO identified the northern side of the Strait of Juan de Fuca as key SRKW feeding areas. This is the geographic area in which the ECHO Program asked commercial vessels to participate in the voluntary lateral displacement trial. 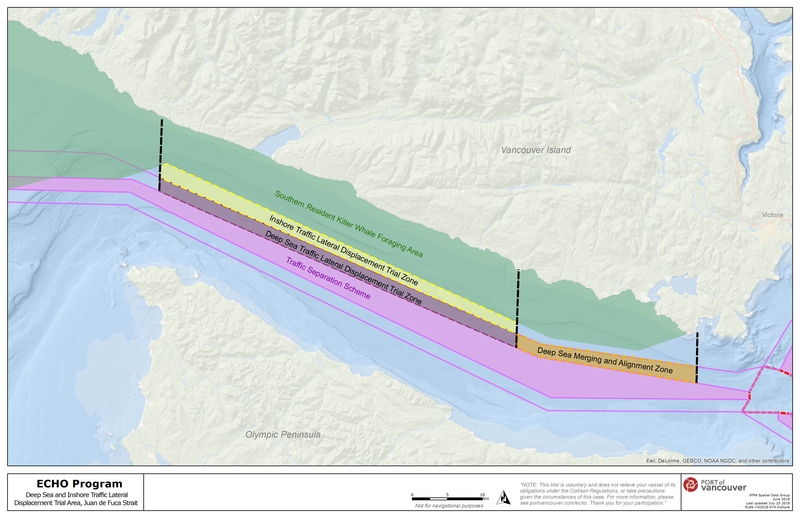 The overall purpose of the trial was to reduce vessel noise impacts in these key SRKW feeding areas. Participation was not expected to impact vessel transit time or fuel consumption rates. The voluntary trial began on August 20, 2018 and ended on October 31, 2018. During the trial, vessel participation rates was monitored using AIS data and regular updates were provided via the ECHO Program newsletter. Underwater noise will be measured before, during and after the trial using a number of DFO hydrophones located in key foraging areas of the Strait of Juan de Fuca. Following the conclusion of the trial, a full analysis is being conducted by the ECHO Program to evaluate results and provide feedback which can inform next steps. These resources are available in Spanish, Mandarin, and Tagalog and are available upon request by emailing [email protected]. Please check this page for up-to-date information about our underwater noise reduction initiatives including resources, announcements and changes. Or subscribe to receive regular updates.